The report from West Brom will be found at Volume 14. That's what the Covered End choir was singing as Charlton collapsed 1-3 at home to Ipswich. A tired team with pride as the only incentive were outplayed by what has to be admitted is a good footballing side. If Ipswich don't make it to the Premiership, the excellent David Johnson could be a good acquistion. As in recent matches, the Addicks showed worrying defensive weaknesses. We will have Greg Shields back next season (playing him on Saturday would have meant a further payment to Dunfermline), but he is untested against a Premiership attack. When we got to Leamington Station, we encountered what we thought was a wedding party given the number of people in smart suits with buttonholes. In fact it was a large group of local Baggies going to Loftus Road. Recently voted as the worst dressed group of supporters in football, the Baggies had decided to make a special day of it. As well as the men in suits, there were a couple of Elvis Presley impersonators. A large and very relaxed crowd was enjoying the sunshine on the pavement in front of the Rose of Denmark. Diamond geezer John Window called in for a chat. Then it was off to the ground for the pre-match entertainment. With Anthony Barness back on the bench, it was evident that Charlton were experimenting with three at the back. This was usually a mistake in the Premiership season and so it proved to be today. Charlton are at their best with the traditional 4-4-2 formation. In a sporting gesture, Ipswich players formed a double line to applaud Charlton on to the pitch. It quickly became apparent that referee Phil Richards from Blackburn was going to give Charlton no favours. Another example of the incompetent and ineffective Nationwide referee, it is a shame that he ever managed to get above the level of Liverpool parks football where he started. An early free kick to Ipswich went off the Charlton wall. The Addicks then put in some good approach work, but were caught by the offside trap. Clearly worried by signs of life by the Addicks, the referee rewarded Naylor for a dive with another free kick. This was played to the unmarked Wilnis on the right who put the ball across the front of goal. Fortunately there was no one there to connect with it, although Scowcroft came close. Rufus then nearly scored a spectacular own goal, but the referee gave the Addicks a rare free kick for an infringement. Ten minutes into the game Charlton started to threaten a little. A good cross was put in by Kitson, parried by the keeper and then Stuart put the ball over. A defensive error by Charlton gave the tractors their first corner on fifteen minutes. My notes for this phase of the match refer to some good work by the Addicks. For example, in the light of later events, it is worth recalling that Tiler put in a good stop on Johnson. At this stage of the match it was difficult to see how either side would make a breakthrough. What I thought was a rather marginal free kick decision against Kinsella on 24 minutes gave Magilton the chance to put a twenty-five yard drive past Kiely. From my position in the East Stand it was difficult to tell whether the keeper was unsighted or whether the wall had been badly positioned, although a defender on the near post would have surely helped? The chances of the Addicks making a recovery did not look good: they were losing the ball far too easily. On 37 minutes the signal came to revert to 4-4-2, but by then the damage had been done. On 43 minutes an attempt by Robbo gave Ipswich some concern. Good work by Chris Powell helped Charlton to their first corner just before the break, thus ensuring fans 50p off admission for the next Broncos game. The ball was played back in from the corner and Stuart acted as provider to Kitson, but the loan player put the shot over. The volume on the speakers had been turned up so that no one could have a conversation. The announcer told us at half time that if a fan got a hat trick, we could have free admission to the Broncos. There was probably as much chance of a fan scoring three as the team in their present mood. We were all hectored to wave our flags like a group of schoolchildren waiting for the Queen Mother. I kept mine down. Despite some early attempts by Charlton to pile on some pressure, there was little sign of a goal. Kitson had been replaced by Svensson at the break and the Swede put in a good cross shortly after ten minutes into the half, but Robbo put the ball wide. Ipswich brought on Reuser in place of Stewart. In view of later gloom, it is worth remembering that on 57 minutes Kinsella put through a powerful shot from a distance which went only just past the left-hand post. A minute later Stuart gave the ball away, Magilton provided Johnson with a good through ball and the pacey striker slotted it home. Almost immediately afterwards, Svensson's shirt was given a very hard tug in the box. The referee made it clear that he had seen much worse on the parks of Liverpool and refused to give what I thought was a penalty. Robbo made it clear to the ref that he would benefit from attending his soccer school and was booked for dissent. Robbo then stormed off to take the corner (the ball having been put out in panic by an Ipswich player at the thought of the penalty). Shortly afterwards, a Charlton free kick led to a Svensson shot that went just over. Robbo then brought down Wilnis off the ball. We all then waited for the inevitable red card, but the referee decided not to spoil the championship party. On 66 minutes the off form Stuart was replaced by Parker. Charlton won a third corner to push the discount up to £1.50, but it was completely wasted. Tiler then dithered with the ball, allowing Magilton to set up Reuser to give Ipswich a 3-0 lead. Charlton won another corner, but it was cleared. Ipswich pulled off Wilnis in favour of own goal specialist Clapham, then eight minutes later Venus was replaced by Thetis. A little Charlton pride was salvaged when a cross from Robbo allowed Andy Hunt to add to his goals tally. The Nationwide's leading goal scorer. 'Give us four' the Covered End had chanted and it came close to that when Parker had difficulty in clearing after an Ipswich corner. Hunt nearly made it two on 84 minutes but his header went over to his evident frustration. Ipswich then had a break powered by Johnson, but he was stopped by Chris Powell. As the final whistle went, the Bloke Behind Me stormed out shouting 'What a load of crap. I want my tea', thus depriving himself of the chance to see the championship trophy presented. The tenor gave a rendition of Valley Floyd Road which contained a number of errors such as 'The mist rolling in from the sea'. Blimey, global warming has hit us quicker than expected! The accent was also a little odd: 'Many haars have I spent in the Covvarhed End chwoir', but it was a nice gesture. Each of the players came out one by one, even McCammon getting his fifteen seconds of fame. It would have been a good idea to allow the crowd to show their appreciation of Super Clive, rather than putting Tiler on fifteen seconds behind him. Some Ipswich fans had stayed behind to watch, but they were soon obscured by smoke from the spectacular fireworks (which more than made up for the weedy ones at the start of the match). Having collected the trophy and their medals, the players made two circuits of the pitch, Claire and Michael Curbishley (Curbs paid a touching tribute to his family in the programme) in front. On the second circuit, Chris Powell removed his shorts and threw them into the East Stand. Meeting Vern from Steyning outside, we agreed that we had enjoyed the spontaneous celebrations at Blackburn rather more. Being stuffed by the tractors did take the edge off things. I was also able to shake hands with No.1 Prague Addick Richard Hunt, still a lurker on the list, but unfortunately not a contributor. We all headed back to the Rose of Denmark where the arrival of list master Glynne Jones was greeted with a chorus of 'There's only one Glynne Jones.' All the favourite songs and chants were sung, mixed with the occasional meancing chant of 'Zimmerboys'. What a great crowd they are! They add much to my enjoyment of match days. At Marleybone the train was full of Baggies and there was some friendly banter as we assured them that Charlton on their present form would not prove too much of a problem for them next week. It will be a strange end to the season with my the wedding of Erith born Sophia Grant the day before. Steve from Sidcup wondered if the Silver Bone could be awarded, but Bob the Dog joined by Hooch the Pooch for a sleep over has given it to Chris Powell in part in recognition of his efforts throughout the season. Chris Powell signs a football before the Blackburn match. I don't usually take good photographs, but Chris's warm personality shines through. It's not good to let in three goals, but except possibly for the first one, Dean Kiely was let down by his defence. Rufus got beaten by the pace of Ipswich players more than once which is worrying as it is what he will have to contend with next year. He and Tiler clearly did not have a good mutual understanding and were sometimes in danger of colliding. Right back is not the best position for Steve Brown and one wonders if it was wise to drop Barness. What worries me about Stuart is that he has one good game in three. Newts had the ball taken off him far too easily. Kinsella put in one great shot, but is showing the strain of an exhausting season. Robbo played with passion, but was lucky not to get sent off. Hunt was condemned as not interested and in need of earning his salary by the Bloke Behind Me, but he did score the consolation goal. Kitson added little in my view and should not be signed for next season. Once you get a negative reputation, it is hard to shake it off and that certainly applies to Svensson . His approach play is often skilled, but he seems to lack the confidence to take a shot on goal which isn't much use for a striker. Parker is much admired by many of the Charlton faithful. I like to see him get a chance, and I would drop Stuart for him at West Brom, but I still have my doubts about how he reacts to pressure. Juneau the Soccer Cat sends her love to David Hatch. The Hiss of the Match goes to the useless referee. When will Charlton ever be given a penalty? There will be only a small group of Charlton fans alive today who can remember when the Addicks were last promoted as champions - from the third division south in 1935. A 1-1 draw at Ewood Park and a 2-2 draw for Manchester City against Pompey was enough to return the Addicks to the Premiership. Now we can all enjoy the celebrations on Saturday. The match itself was nothing special. Charlton confirmed their credentials as late season draw specialists. They played an excellent passing game in the first half and it was a Chris Powell cross that created a scoring opportunity that was finally completed by Mathias Svensson. Charlton seemed more defensive and hesitant in the second half and Blackburn's pressure eventually found its reward through a penalty strike through Lee Carsley. The match became increasingly scrappy after that, but about ten minutes from the end the news filtered through that City had lost their 2-1 half-time lead at Pompey. The shouts of 'champions' spread through the Charlton end and fans started to make their way to the front to salute their heroes. We left Leamington at 10, but lighter traffic than expected meant that we were in Blackburn shortly after noon. Stopping at Knutsford services, somebody shouted 'there's Wyn Grant', but I wasn't sure whether they were a fan or a student. We bumped into Tom Morris outside the ground who once again had been denied access to the press suite, such is the respect shown to photographers. After Maggie had added to her badge collection from the club shop, we decided to wait for the team coach to arrive. Roland Silcox was there waiting to add to his already substantial collection of photos of the team getting off the coach - but they are very good: one of Deano is reproduced below. Taking our seats, the bloke behind us turned out to be a long standing Addick for many years resident in Lancashire. He usually supports Fleetwood these days and has not been to the new Valley. I couldn't work out who the out of condition elderly geezers pounding up and down the pitch in tatty t-shirts were, but then I remembered that it is the fashion these days for the officials to warm up. It was raining hard for the hour before the match, but as the game started the sun came up, although the pitch remained slippery. This was particularly true of the patch of mud in front of Deano's goal in the first half at the Charlton end. My notes of the match got into a muddle in the celebrations afterwards. Given Charlton's high standards away from home this season, it was not a classic performance, although they were very much in charge for most of the first half. The match started with some early Blackburn pressure during which Barness made a poor clearance. Blackburn put in a shot that went just over. Ostenstad was injured, but soon recovered and was a threat down the wings. Stuart burst through but Andy Hunt blazed over. Good approach work saw Newts draw a diving save from Kelly. An error by Brown found Deano in a situation where he had to make a good diving save at the expense of a corner taken by McAteer. A Charlton corner followed, but it was easily claimed by Kelly. The referee, Mr Lynch from Kirk Hammerton (?) was keen on blowing up a lot. He stopped Newts and Rufus for a long word. What this was about was not immediately clear, although he might have been asking Rufus whether it was better to shave your head completely rather than waste money on hair restorer. Blackburn made a couple of threatening breaks, the first stopped with calm authority by Richard Rufus, the second by Steve Brown. Chris Powell was also on form, contributing in attack and defence. He got his reward when he put in a great cross, Hunt got a touch, Kelly parried the ball and Svensson finished off with a header from a few yards out. Hunt nearly made it 2-0 just afterwards, but narrowly missed. Deano was then called into action to keep Charlton in the game with a brilliant fingertips save. Then it was captain Mark Kinsella's turn with a clearance off the line. Charlton looked as if they might be in with a chance for a second goal when Kelly dropped the ball, but he recovered the situation. Ashley Ward was booked on 36 minutes for a blatant foul on Steve Brown. Robbo had a half chance, then Newts put in a great cross, but the connecting header went just over. Deano halted a Blackburn attack by authoritatively punched the ball out, and then made a great save. Davidson had to be stretchered off (to applause from the Charlton end) and was replaced by Dunn. Rufus was also injured just before the break and was limping for a while, but was fit again by the second half. The Stoke-on-Trent Addick came over for a chat at half time. He wondered if my pre-match optimism would still be justified after ninety minutes. The first half, however, had clearly gone well with Charlton having six shots on target to Blackburn's three. Charlton lost their upper hand in the second half, the introduction of Gillespie for Ward on 59 minutes particularly helping to fortify Bolton. An early free kick for a foul on Svensson was wasted by Charlton. Blackburn won an early corner which was taken as a short corner but ended in an offside decision. Blackburn then put in a shot which went just past Deano's post. Stuart put in a ball to Hunt, but his effort was way over. When Blackburn threatened, Steve Brown made a decisive clearance. McAteer picked up Blackburn's third yellow card, Carsley having received one just after the break. Hunt was pulled off for Kitson on 73 minutes, the Addickted making it clear that they would have preferred Svensson to be withdrawn. Blackburn made their third substitution, taking off the impressive Ostenstad in favour of Burgess. Stuart burst through, but had no one he could lay the ball off to. A tiring Robbo was replaced on 81 minutes by Scott Parker who immediately showed some real skill. By this time, the news was starting to filter through from Portsmouth and I found it increasingly hard to concentrate on the game. Blackburn had a chance to deny Charlton with a free kick on the edge of the area on 86 minutes, but the shot blazed over. The one remaining incident of any significance was the booking of Steve Brown for a foul on 90 minutes. All that the Addickted want to do now was to celebrate the championship. Scenes of incredible emotion followed the end of the game. The players ran towards the Charlton end clutching 'champions' banners. Mark Kinsella threw his shirt into the crowd. An overjoyed Alan Curbishley, once he had finished embracing his players, took off two layers of jumpers and threw them to the fans. Other players followed his example and my wife says that she has a photo of one member of the team having his shorts removed. Director Bob Whitehand was seen wandering round the pitch with a bottle of champagne. Curbs was also quaffing from a champagne bottle. The team went up to the other corner of the pitch to acknowledge Blackburn fans who were generously applauding them. In the upper tier of the Jack Walker stand, a small group of Blackburn fans waved the tricolour in salute to Charlton's Irish internationals. The players went off for a while, but came back for an encore, joining hands to run towards the Charlton end and then throwing themselves on to the soggy pitch in supplication, no one being more prostate than a delighted Keith Peacock. An Addick in his sixties standing next to me said, 'I can't believe this is happening'. Andy Hunt was delighted by a special rendition of the 'man up front' song and Rufus clearly took pleasure in the chorus of his name. Deano was selected for special acclamation by the fans. Chris Powell did his usual 'three cheers' routine as the team finally headed down the tunnel, but then the popular player kept popping out again like a rabbit out of a hutch to the delight of the Addickted. In all the excitement I lost my scarf which I have had for many years. Outside there were slaps on the back and shouts of 'well done lads' from the Blackburn fans whom I have always found friendly. We went round to the players' entrance again where Chris Powell was patiently signing autographs, many for Blackburn fans. We turned as three Addicks arrived making a lot of noise, one being former fanzine editor Andy Lopata with his face painted. As we headed down the motorway, we passed a group of stretch limos hired by fans who had dressed themselves in 'Blues Brothers' gangsta mode (and very effective it was too). At one point one of them was leaning out of the limo in stationary traffic waving a bottle of champagne. Charlton banners and scarves were waving among the slow moving traffic, much to the distress of one car containing Ipswich supporters. Match analyst Bob the Dog has awarded the Silver Bone to the popular Dean Kiely. He may have let in the penalty, but he made two great fingertip saves in the first half. Chris Powell was once again on great form, providing the assist for the goal. I hope that he gets one of the runners up positions in Player of the Year: he is a skilled player and he has a great rapport with the fans. Rufus once again showed what a class player he is. I can't believe that one lister regards him as a donkey who should be sold while we can get some money for him. He is real Premiership class. Steve Brown was as dependable and as vigorous as ever, picking up a booking. Barness is not an outstanding player, but we should give him credit for coming in and doing a job competently and effectively. Stuart had one of his better matches, contributing effectively and bursting through with more pace than one might think he has on more than one occasion. Newts made some of his usual penetrating runs down the wing. Robbo was a little below par, making one or two errors. Kinsella has had a long season in both domestic and international matches and one must guard against the danger of burnout in this player of real quality. Hunt has been showing a few signs of fatigue in recent matches. The Bloke Behind Me thinks he is a lazy player: just like Killer? A good striker does a lot of hanging around until he can seize his opportunity. He also objects on the grounds that he scores more goals away from home, matches which the Bloke Behind Me does not spoil with his moaning as he never comes (hence he has missed our best performances this season). I think that some people in the crowd were disappointed that Svensson scored. Like others, I think that he is just starting to find his form. Only Kelly's skill stopped him scoring a winner in the second half. Whether he is a Premiership quality player remains to be seen. Kitson came on and displayed grit and determination, but I remain unconvinced that he is the striker we need. The commitment that is one of his qualities also helps to explain his proneness to injury. Scott Parker came on late and confirmed that he is a player of real promise. A poignant moment was after the game when Scott and Charlie MacDonald came out in the sunshine to chat with family and friends, and Charlie was heard to say, 'well, there's next season.' Let's hope there are opportunities for him and some of the other younger players. There was to be no Hiss of the Match in conformity with the joyous spirit of the day, although there Juneau the Soccer Cat was in risk of being awarded it herself after knocking over the celebration champagne (fortunately not much was lost). However, it was eventually decided to award it to lister James who posted a series of E mails calling for Curbishley's head. Only at Charlton! As Alan has said, we didn't expect to go up two seasons to go and to be honest we weren't fully prepared. This year we have more time and more money. I am confident that we can stay up. But for now, enjoy the celebrations: we have all earned it through staying faithful through the dismal and difficult years. There's only one Dean Kiely! He came through a tough school: Leamington Hibernians in the Mid-Warwickshire Boys League. Warwick Addicks salute you! 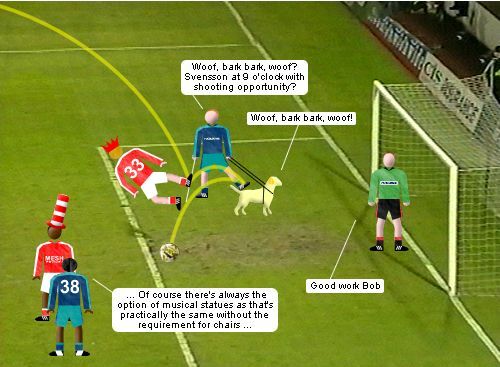 Is the above cartoon from a very amusing account by a Huddersfield fan of the recent match at The Valley a veiled insult to match analyst Bob the Dog. Does it imply that he interfered with play to benefit Huddersfield? 'In the Premiership next season' shouted a group of youngsters in Leamington as we returned home. Alan Curbishley and Keith Peacock led the players around the pitch to acknowledge the shouts of the crowd at the end of the match. However, the applause was somewhat muted, even though Ipswich could no longer overtake Charlton on points and were well behind on goal difference (and finally counted themselves out on Saturday by losing 3-1 to the Super Hoops at Loftus Road). A lister reported that the post match chant in the Oak was 'We're red and we're sort of up.' At the beginning of the season, most supporters would have been happy with an automatic promotion place, while expecting nothing more than a play off slot. Now the expectation is that we will be champions by a wide margin. Hence, we are supposed to crush in form teams like Portsmouth in Manure like fashion instead of drawing 1-1. With their exceptionally noisy fans in full voice, Portsmouth made it clear that they intended to go on the attack and had Charlton pinned down in their own half in the opening minutes of the game. Charlton were given some encouragement when, within five minutes of the start, Portsmouth striker Steve Claridge had to go off after a clash with Steve Brown to be replaced by Rory Allen. With the betting shops closed, it was evident that Claridge was injured and he had to be given a piggy back off the pitch to applause from Charlton fans near the tunnel. With Portsmouth making a break through Derry after an error by Barness, Richard Rufus was called on to make an important block. Deano was then called into action to keep the ball in to prevent a corner. With nearly fifteen minutes gone, Charlton managed their first shot on goal. Robbo put in a powerful shot, but the effective Hoult in the Pompey goal first spilled it, but then saved it comfortably enough. Robbo then put in a cross to Newts at the right hand post, but he was not well positioned and his header went over. Barness then put in a shot which was not far over. Robbo won a corner and this was followed by a second. However, although Robbo was taking the corners instead of Kinsella, they did not look more of a threat. Newts drew a diving save from the keeper. Portsmouth were giving a dubious free kick by the referee and Kiely had to palm the ball out. Newts was brought down as he started to forge through the centre of the pitch and Edinburgh received a yellow card. Powell put in a nice cross to Hunt but his header went over the top of the goal. Steve from Sidcup thought that we were starting to find more space, but this was also true of Portsmouth. There was a worrying scramble in front of the Charlton goal. While a subsequent free kick was being prepared, Deano came out to speak to Brown and it didn't seem as if he was enquiring how the home decorating was progressing. Portsmouth then managed to find space on their left (Steve Brown was easily evaded) and a cross from Edinburgh was collected by Bradbury who delivered a powerful header past a stranded Kiely five minutes before the break. Charlton didn't look like pulling back an equaliser by half time, although Hunt had one shot on goal. The hallmark of Charlton's play this season has been coherent teamwork and this was missing in the first half. The pressure to secure the championship seemed to be making the players nervous. Things didn't improve very much in the opening phase of the second half. Robbo put the ball across the front of the Covered End goal from an angle, but it was unclear whether it was a cross or a shot. Good work by Robbo secured a corner, but this was wasted, as was a short corner that followed shortly afterwards. Making effective use of corners remains one of the weakest part of Charlton's game. Nevertheless, Charlton's game was starting to improve. Hoult had to make a save on the line from a header and a few minutes later Pompey nearly scored an own goal with a header which went just over the bar. The resultant corner ended up with an offside decision. Kiely was called into action to make a good save. Charlton were piling on the pressure and their reward finally came with a goal by Stuart on 64 minutes, making use of highly creative play by the much maligned Svensson. The charming Kevin Harper and Robbo then got involved in a fight down by the dugout. The referee awarded both players a yellow, although he could have justified sending both of them off. With the prize of a draw within their grasp, Pompey increasingly relied on time wasting. When Whitbread was replaced by Myers, the exchange took ages, although the exasperated ref held his stopped watch in the air. Rufus then put in a great shot (with his legs) which drew an equally great save from Hoult: Petterson would never have stopped it. An opportunity with a free kick was completely wasted by Barness. Newts put in a good cross, but it was intercepted by the unfazed Hoult. Being at The Valley seems to draw the best out of some keepers. Portsmouth sub Allen was pulled off for Awford. There was no sign of any activity on the Charlton bench, other than Mervyn Day going periodically ballistic, although at one point Curbs seemed to be very upset about something as well. The option of trying someone else was not taken, although it was by no means clear who should be pulled off and who brought on (Svensson for MacDonald would have been popular but not necessarily wise). There was always the worry that Portsmouth could get a second goal and these thoughts were nearly realised when Stuart gave the ball away, but Rufus was able to make a decisive intrception. Charlton were increasingly camped out in Pompey's half. Near the end of normal time, Robbo had a great chance when he was positioned in front of the goal with only the keeper to beat. 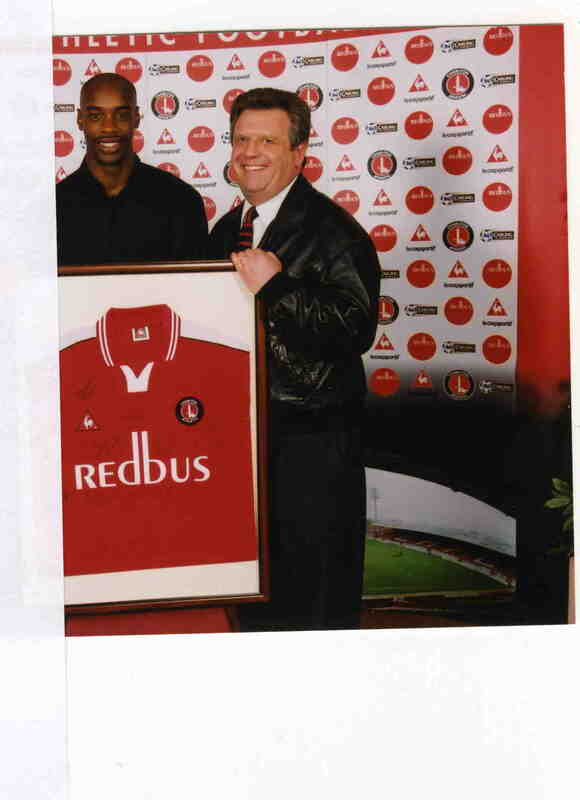 But for some reason he hesitated and he missed the chance to secure an eternal place in Charlton's history. As desperation set in, a wild shot from him went way over while Svensson also put the ball high over the bar. There were to be no celebrations of the championship at the Rose of Denmark. I had been pessimistic about this match all day, but I actually feel quite optimistic about Blackburn. Away from the pressure generated by an expectant home crowd, Charlton may be able to play more fluent football. An excited Bob the Dog had been collected by Hooch the Pooch at 7.30 in the morning. The dogs had difficulty in selecting a candidate for the Silver Bone, but decided to give it for effort and commitment to John Robinson . Bob the Dog commented, 'No one is mentioned as much in the master's notes on the game. Deano could not have stopped the Bradbury header and made a couple of good saves. Rufus made some crucial defensive interventions and came closing to scoring. Chris Powell was constantly surging forward and was generally effective when Pompey made one of their relatively rare attacks. At one point he intercepted a corner kick and got the ball away. Brown provided some powerful headers, but was not at his best, being partly at fault for the Pompey goal. Barness was unfortunately at his most hapless (couldn't someone else take the free kicks?) although he did make some good passes across the pitch. Newts made some good penetrating runs. I thought that apart from his goal, Stuart had a rather poor game, giving the ball away more than once. Kinsella had some moments of creativity, but I do think that he is below the heights of the earlier part of the season and this is one reason why the team has not been playing as well. Hunt had a very poor game. Admittedly, he was subject to some appalling fouls by a physical Portsmouth side for which he got little protection from the ref, but he never really looked like scoring. Svensson is clearly public enemy number one with large sections of the crowd, but I thought that he displayed more real skill than most of the players. The problem was that he never looked scoring and one only expects this of a striker whose name begins with 'L'. Juneau the Soccer Cat thought that the referee was poor, but no more than usually so. Harper was a nasty piece of work. However, the Hiss of the Match was given to the Bloke Behind Me. He was, of course, in full moaning mode throughout. At one point, he asked 'Anyone want a Division 1 season ticket for next season?' That prompted me to think, 'Yes, if it means getting rid of you.' At another point, he commented, 'They will be carved up by every team in the Premiership, even Coventry' (whom I seem to remember we beat 3-2 earlier in the season). Everyone knows that the present squad is not good enough for the Prem and that we need a striker of real quality and another (preferably left footed) wide player. As someone said afterwards, 'Next year we'll be pleased with a 1-1 draw at home.' At least promotion will damp down what have become ridiculously excessive expectations. I have missed two home games this year. The first was the dreary 1-0 win against Crewe: I heard the result standing in the snow in Harvard Yard at Boston. This time my cell phone sprang into life as I was standing outside the campinale on the University of California campus at Berkeley. An earnest discourse from a senior official from the Japanese Ministry of Foreign Affairs about exactly why Japan's relations with Ghana had broken down was interrupted by the news that Charlton had lost 0-1 at home to Huddersfield. I reflected that perhaps it wasn't such a bad match to miss and I could now look forward to winning the championship against Portsmouth when I would be at The Valley. The discomfort of a quick trip to California had been alleviated by my usual strategy for getting an upgrade working in the unfamiliar setting of Virgin Atlantic. I was surprised, however, when I sat down and was approached by a young lady who asked if I would like a stress reducing massage. I was able to take a look at part of a Major League Soccer match between Kansas City Wizards and San Jose Earthquakes ('earth tremors' would be more like it: Kansas City won 2-0). There was some neat passing play, but what happened in the last third was less impressive. The players seemed curiously disengaged while there was hardly any reaction from the rather thin crowd. Indeed, the camera kept panning to some attractive young women in the 'audience'. On Saturday night I was invited to a party at Piedmont, a separately incorporated East Bay community. I had never been to Piedmont before: it is the sort of place where the police patrol each street four times an hour. My host's house had two huge picture windows. The ground fell away sharply below the house. In the foreground was the city of Oakland now headed as mayor by Jerry Brown, the former Governor of California popularly known as 'Governor Moonbeam' (older readers may remember his former girl friend singer Linda Rondstadt). The view ahead then included Alcatraz and the Golden Gate bridge. Slightly to the left was downtown San Francisco. Its mayor is now Willie Brown who once ran California as speaker of the lower house. I remember one member of the assembly making a feeble joke about Brown's folically challenged condition and receiving in return the most withering look I have ever seen, indicating that the recipient had a short life in politics. A taste for fast cars and faster women has not impeded Brown's career. As attentive young women distributed the canapes and refreshed glasses, I asked my host how much the house was worth and he quoted a seven figure number. I was about to ask him if he had ever thought of investing in a soccer club, but he moved on to another guest. Defenders rarely win Player of the Year but Richard Rufus has been superb in defence and attack this year. And he's a really nice guy as well. Scroll down for a photo of young Matthew Robinson presenting him with a bottle of champagne. Richard Rufus's red kit sponsor is Maggie Grant. Fifth Moon of Jimmy Hill's chin: Recently rebuilt, the moon is usually the first site to put up a fan's match report, but has many other features as well. Goodbye Horse web site: Some great photos from Blackburn here. We wish the fanzine well under its new editor Kevin Portch. Soccerlinks: Excellent and comprehensive set of links for British football, including fan pages (which are given a rating by visiting researchers).